Every Monday evening Bon Appétit editor-in-chief Adam Rapoport gives an insight into his brain by taking over our newsletter. He shares recipes he cooked, restaurants he ate and more. It gets better: If you sign up for our newsletter you'll get that letter before everyone else. How come we sneak? Labor Day and I still have to write about BLTs ? I mean, seriously – it seems someone has shirked his responsibilities. Yes, I love a cast-iron pan as much as all others in BA . But I'm making my BLT bacon in the oven . Grating inserted in a sheet metal compartment, 400 °. Never perfect. And ideal for a crowd. And with "Crowd" I set the bar for two people, because who ever eats a homemade BLT? As for the bacon itself, I like old supermarket bacon: crispy, but not brittle. I'll keep the super thick stuff for steakhouse visits. Do you want this letter before it comes to the website? Sign up for our newsletter ! Next week Bon Appétit Foodcast Amiel Stanek pleads strongly for Shish-minced Iceberg Lettuce the kind you get in drive-in style Smash Burger . Shretuce delivers the crunchy ice coldness, without the whipping of the whole leaf, which you often get when you bite on the sandwich. Occasionally, if I feel like it – or just in a creative sandwich shop – I'll be peppery with rocket. It's nice to bacon. But please do not take that as a formal endorsement. When I go to the Gee Whiz Diner near our office on an occasional (maybe somewhat hangover) Wednesday, and I'm absolutely looking for a BLT, I'm fine with a thoroughly intoxicating tomato from the supermarket. But at this time of year, when I only make BLTs at home, it has to be the real deal: plump, heavy heirloom tomatoes striped with yellow and blood red, maybe a bit lilac or green. And when you slice into them with your serrated knife their clear, fragrant juices gather on your cutting board. One: Do not forget to salt your tomatoes while building your sandwich. Yes, bacon is salty, but tomatoes need their own attention. A little freshly cracked pepper never hurts. Okay, we probably will not agree. Pursuits insist on white bread (obviously roasted). 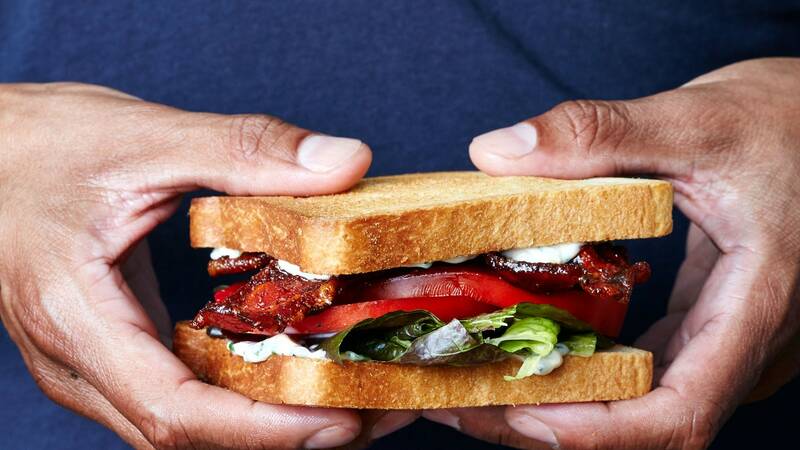 And I understand – if you look up BLT in a dictionary, you'll see that. But at some point in my life (maybe during my time at the University of California at Berkeley, go bear! ), I became a multi-grain, whole-grain type. I want my bread to have weight and texture. As far as the wildcard varieties are concerned, I'm not mad at toasted ciabatta. It's basically white bread, but with attitude. Mayo Mayo, Mayo, Mayo. Above and below. I drive with Hellmanns, but if my Instagram friends tag me for Dukes, I'm not one who argues. Just send me a case. And if my friends feel like chastising herby, homemade aioli I will not quarrel with them either. avocado? I love avocado. On pretty much everything. But a BLT of the high season should not need one. Mid-winter? Other story. egg. My wife loves a Crunchy Olive Oil Fried Egg on her BLT. Bite into the sandwich, and the yolk trickles down the layers of bacon. Kind of genius. But if I make BLTs for a lot (see above), do you know what I do not have time for? Make crispy, olive oil fried eggs . Sorry, Simone!